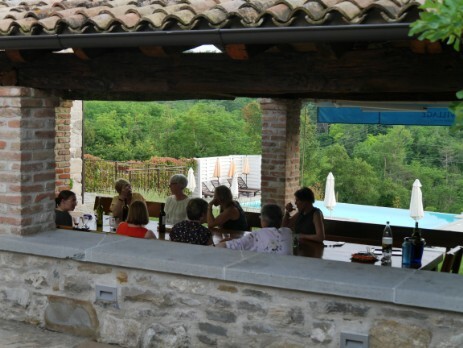 Flutes at the Barns is excited to introduce new players - and welcome returning ones - to our beautiful Croatian private villa in the heart of Istria, the perfect venue for a week of music-making and local exploration, last visited and adored in June 2018! Course tutor Zoë Booth will be joined by regular FATB course accompanist, Mark Smith, to welcome you to an exclusive Flutes at the Barns - strictly limited to just nine playing participants - in Croatia in May/June 2020. As participants settle into their amazing surroundings, a few course activities will begin on Saturday, with the full range of activities commencing on Sunday morning. There will be up to four sessions each day featuring a varied programme, including an individual 45-minute lesson with Zoë for every participant, a private half-hour rehearsal with the course accompanist, group sessions including workshops on repertoire, technique, interpretation and ensemble playing, small ensemble playing (some with coaching), and the chance to perform in informal participant concerts and/or a masterclass. The tutors will also perform an exclusive tutor concert. The course will conclude with a friendly and supportive concert on Friday afternoon, during which participants may choose to perform solos, ensemble pieces, in flute choir or simply enjoy supporting their fellow performers. Several sight-seeing excursions by minibus have also been arranged, in order to make the most of being in such an interesting part of Croatia, and to take in some of the local interests, tastes and experiences (see provisional course schedule, below). Flutes at the Barns has always encouraged a friendly and supportive atmosphere in which participants of any ability level can improve and make music together without pressure. Those who do choose to take advantage of the solo and/or performing opportunities will be given every encouragement from their tutors and fellow course-goers. Participants are recommended to prepare solo material as the basis for their lesson and accompanist session, and may also bring up to two other pieces which could be performed in any of the participant concerts/masterclass, if they choose to do so. All other music will be provided, so please expect sight-reading at your level. If you play piccolo, alto and/or bass flute please do bring them, and you will get the chance to play them in the ensemble sessions. Breaks and mealtimes are often sociable events, with much like-minded musical talk, however there are also chances for some time alone during the course, whether to rest, practise or explore the local landscape. Saturday 30th May - participants arrive in time for lunch (late-morning transfers from Pula airport), providing time to settle in at leisure, meeting other participants of FATB Croatia May/June 2020. Sunday 31st May - a very musical first day of the course is followed by a late-afternoon visit to the scenic town of nearby Zrenj; after a short exploration on foot, enjoy a delicious evening meal at a popular local restaurant which offers tasty Istrian specialities served on the terrace, overlooking a view of Cicarija mountains. Monday 1st June - after a morning enjoying the villa, musical workshops, lessons and classes, there is just a short ride to a beautiful local venue for a memorable group rehearsal. Later, continue to the Kabola Winery in Momjan to for the chance to try highly-praised locally grown wine and olive oil and hear about the production process. Return to villa for the evening meal. Tuesday 2nd June - after the first flute class of the day, it's a very short journey by minibus to take part in a unique guided truffle-hunt on foot, complete with two truffle-dogs! It may not be the perfect time of year to ensure we'll come up with the "diamonds of the earth" for which Istria is so famous, however it will provide an insight into truffles have shaped the history and economy of the local area, as well as to hear about some of the record-breaking truffles found and - of course - a chance to try this unusual delicacy! Return to the villa for lunch and an afternoon of musical activities, including the first participant concert. Wednesday 3rd June - flute-playing sessions frame the day’s visit to nearby Buzet. We will be taking lunch at a picturesque venue in Hum - regarded as the world's smallest town - before continuing for an afternoon visit to wander the cobblestoned streets of old Buzet, learn more about the local Glagolitic alphabet popularly in use throughout the ages, enjoy a guided tour of the small regional museum and then a chance to shop for local souvenirs and enjoy an Italian ice-cream in the sun in a most picturesque setting. Evening meal at villa. Thursday 4th June - the morning provides the option to remain at the villa for continued musical focus, or to visit the local thermal spa for bathing and/or treatments. By late morning the participants are reunited once more, building up an appetite through the musical sessions for an evening meal in the nearby hilltop town of Oprtralj. 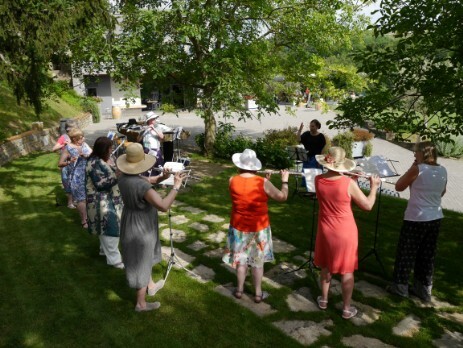 Friday 5th June - our final full day at the villa keeps the focus on flute playing, with much music and rehearsing (plus the tutor concert) in which to delight. The final afternoon participant concert will be followed by a celebration dinner. Saturday 6th June - depart the villa after breakfast, end of FATB Croatia May/June 2020. *This is a provisional schedule only; Flutes at the Barns reserves the right to make changes. The private villa which provides the picturesque backdrop for this very special Flutes at the Barns course is situated in north Istria, Croatia, close to the ancient town of Buzet. The longest Istrian river, the Mirna, winds its way through the fertile valley of the Buzet area, providing the forests with rich harvests of the famous and excellent white truffles, hence the town is known as the “city of truffles”. Istria is known for its pleasant climate (average June temperature 25 degrees), the wonderful local wine, delicious traditional cuisine (featuring the famous truffles) and local natural and historic landmarks, all of which will be experienced by players of FATB Croatia May/June 2020. 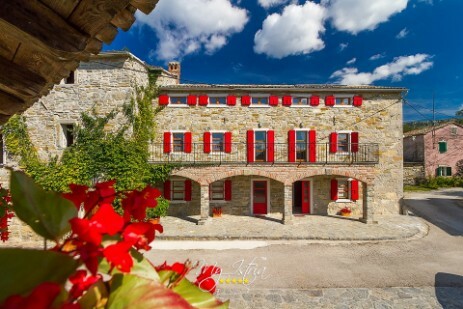 A characterful old stone property, our home for the week has been restored with modern features, including air-conditioning and wifi throughout. Bedrooms (each with a private bathroom, and most ensuite) and music studios are spread across the four properties that comprise the villa, providing ample opportunity for separate music-making spaces. There are comfy places to relax and enjoy the view, the company and/or the local tastes, with memorable sitting and dining areas overlooking the infinity pool, the attractive garden and panoramic views of the local centenary woods. Whilst on Flutes at the Barns allow yourself to be taken care of, with catering freshly prepared to the highest standard by the visiting local chef, offering menus incorporating local produce and traditional Croatian cuisine. Whilst we are at our musical base, meals will be taken together in any of our inside or shady outside dining-spaces, with breath-taking views of the local countryside. We will also dine out for lunch in Hum and for two evening meals, in Zrenj and Oprtalj (not included in the course fee). As well as hearty breakfasts, lunches and dinners, to sustain your energy levels throughout the music-filled days, morning and afternoon breaks will offer snacks as well as hot drinks. Special diets are accommodated. Catering will start with lunch on Saturday 30th May, finishing with breakfast on the following Saturday. There is no bar; alcoholic drinks may be brought to the course for your own consumption, or to share with friends, and there will be occasional stops to stock up at the local supermarket. £1500 (£250 deposit payable upon application, balance due by Saturday 4th April 2020). The course fee is inclusive of full-board residential participation, transfers (to/from Pula airport), transport and excursions, as well as most refreshments and meals. Not included in course fee: your flights; travel to the villa if arriving independently (or if arranging flights which do not meet the late-morning transfer window to/from Pula airport, advice will be given); some meals/refreshments out (one lunch and two evening meals); any spending money. Application forms can be completed online or sent to the course administrator by e-mail or post. Nearest town: Buzet, Istria, Croatia (approximately 3 km away). Nearest airport: Pula (approximately 1 hour 10 mins away). Participants are responsible for arranging their own travel to/from the course, however guidance and advice will be offered on flights/travel plans. Transfers between Pula airport and the villa are included in your course fee, providing that the transfer window is met, as per the advice. There is free parking if you are arriving by car; please ask the course administrator for address/directions. Minibus transport to/from all excursions throughout the week are included in the course fee. Partners are welcome to accompany flute participants and share their accommodation at a reduced cost of £995, taking full part in all except the musical activities. If you are booking with a partner, please note the deposit, payable upon application, is £400.